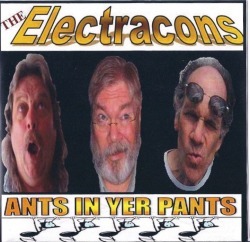 On April 9th, 2010 The Electracons returned to the studio with their newest member Rick Offutt to lay down new vocals and keyboard parts to the Ant's tracks of 'Heavy Third', 'Pancake Day', 'Suppressed' and 'Extra High'. We're really excited about the new 'Bigger Sounding Electracons'. We hope you'll enjoy the snippets of the new versions that can be found in the audio file below.